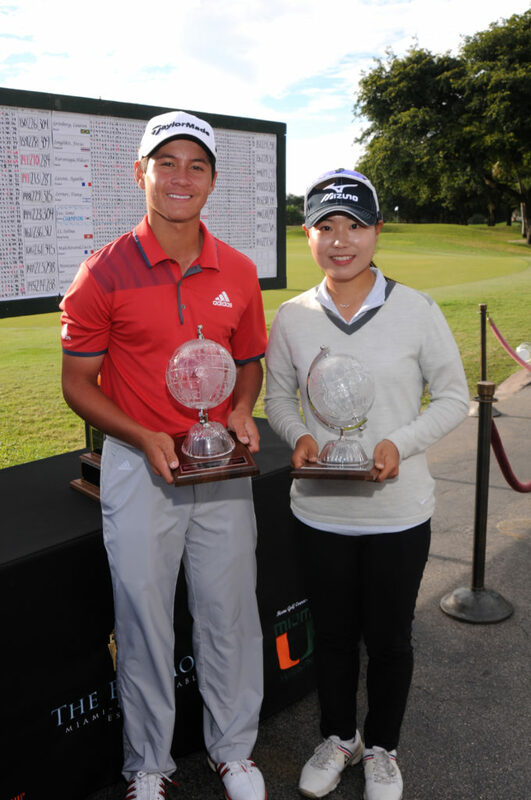 Australia’s Karl Vilips and Somi Lee from South Korea are the 53rd Junior Orange Bowl International champions. Vilips posted a final-day 2-under par 69 for a four day 12-under par total of 272. Lee carded an even-par 71, her first round of the week over 70, which was good for a one-stroke victory over France’s Agathe Laisne. In an exciting down to the wire finish, both players birdied their last two holes. A chilly morning with swirling winds gusting to 20+mph put some extra bite in the famed Donald Ross golf course at the Biltmore hotel, players often stuck between clubs for approach shots where, particularly on long water-guarded par-fours, estimating the wind force becomes critical. The Boys tournament came to an exhilarating climax. With the final three players, Vilips, France’s Edgar Catherine and defending champion Norway’s Kristoffer Reitan all tied at 10-under par, Vilips sealed his wire-to-wire victory with a 25-yard pitch from just short of the putting surface on the closing par five that skipped once, twice, then disappeared directly into the cup for an eagle three. “It feels fantastic,” the winner said, expressing an emotive mixture of euphoria and relief. “I did not have a lot good stuff today. My driving was off and my putting was a struggle and I was never able to get anything going. But well, that one shot really changes everything and I’m absolutely delighted.” He didn’t say so, but his crucial curling five-footer par-save on the 71st hole made it all possible and proved why this 15-year old Australian has a huge future in the game. Catherine proved he has plenty of heart, fighting back from a double-bogey at the 9th, where his tee ball caught a tree branch near the tee. Defending champion Reitan bunkered his long-iron approach to the final hole and had to settle for par and third place. Chile’s Joaquin Niemann, the 2014 champion, carded a strong 68 to claim 4th spot in this strongly international field. The Girls tournament turned into an equally thrill-filled final which went to the wire, South Korea’s Somi Lee getting up and down at the final hole for a birdie-four that cemented a one-stroke victory over France’s Agathe Laisne with Canada’s Monet Chun in third place. Laisne also placed second last year. “This is my first tournament outside my home country,” Lee said through an interpreter, “and I’ve been very nervous. So obviously I’m delighted to have played well when it mattered.” No shot more crucial, in retrospect, than her approach to the water-guarded 17th, where she followed Laisne’s flag-tight approach with one that was even closer. Scottish Boy Champion, Eric McIntosh (Bruntsfield Links) finished tied for 42nd place with a last round of 74 for a 302 total.